I hope you all enjoyed a long, relaxing weekend. Three day weekends are so amazing. I love the feeling at the end of Saturday evenings, knowing I have two more days ahead. We had quite a fun weekend. We went out to eat Saturday evening and then went to see X-Men. Sunday morning we got up early and drove south for brunch, or a feast rather! The two of us ordered a skillet of cinnamon rolls, French toast, blue corn pancakes, a side of potatoes and thick cut bacon. I had a “manmosa” to polish it off. That’s a pint of champagne with a splash of OJ. Before returning home, we did a little birthday shopping. Sunday night I made salmon tacos with pineapple avocado salsa. We spent most of the day Monday lounging around the house and made mini burgers for dinner. I tried my hardest not to work all weekend. I did some baking, a lot of sleeping and lounging around. Oh, I also started watching True Blood, nonstop. Today we are celebrating my twenty-eight birthday, although I have a hard time admitting that. 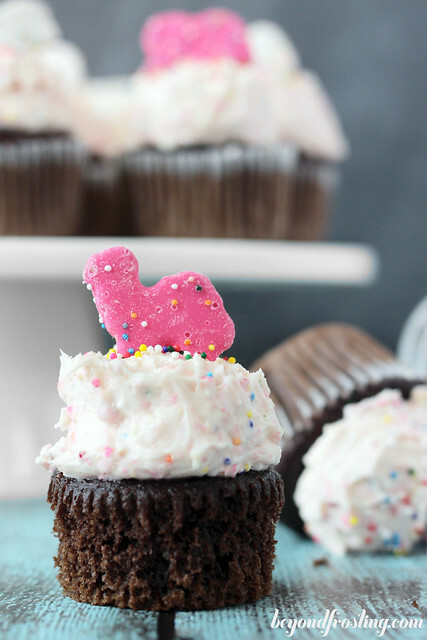 What better way to celebrate than with Circus Animal Frosting. You guys know how much I adore Circus Animal Cookies. 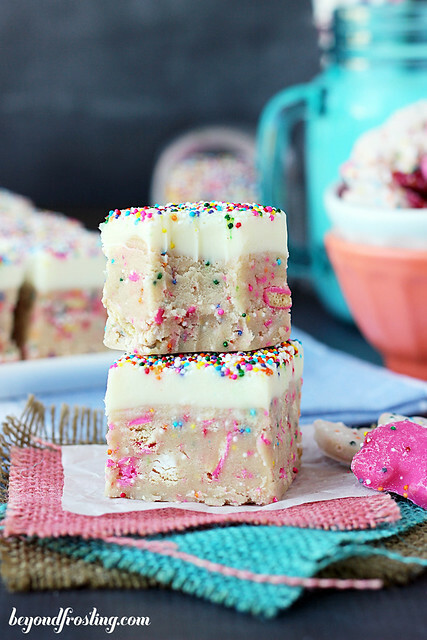 You guys might already know about my Circus Animal Fudge and My Circus Animal Cookie Dough Truffle Bars. I couldn’t really tell you which one is my favorite. I have a problem. Once I find something I like, I can’t stop baking with it. I want to make ALL THE THINGS. So I can spend an weekend elbow deep in Circus Animal Cookies. It’s a serious problem really. I have had this frosting on my mind for while. I love mixing my favorite candy and treats into frostings. 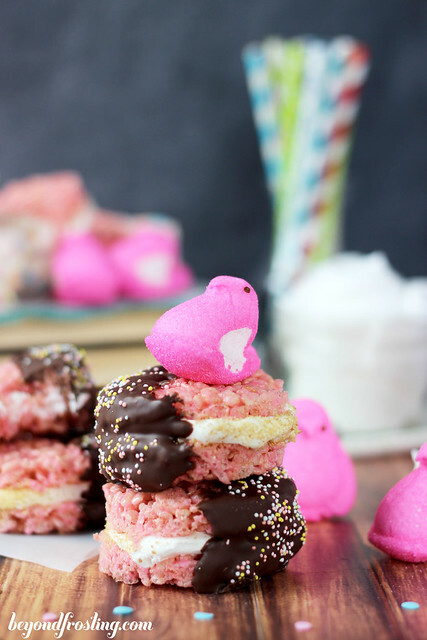 Plus, the hot pink and sprinkle-coated cookies are just too hard to resist. This frosting is a pretty basic buttercream with the cookies mixed in. I tried adding almond extract, but the flavor was over powering. 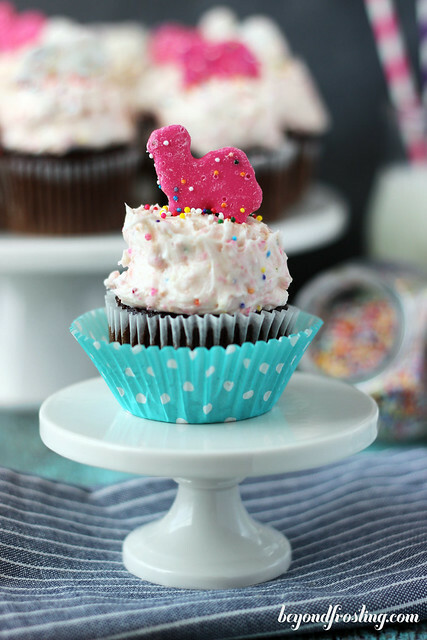 This frosting is a bit sweet, so I tend to use a bit less than I normally would on top of the cupcakes. 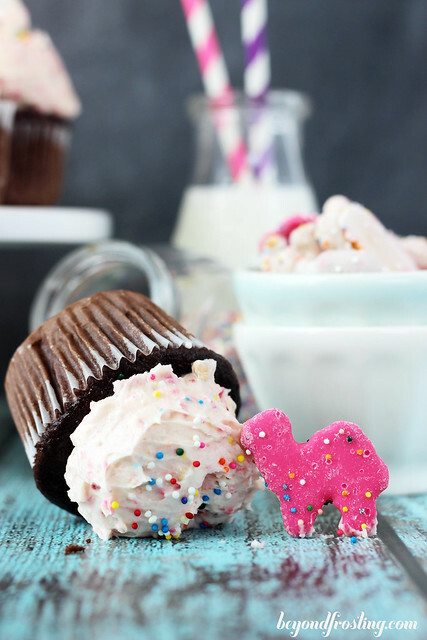 You likely won’t be able to use a piping tip for this frosting due to the chunks of cookies. 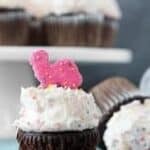 Therefore, I would suggest to use a cookie scoop or knife so spread the frosting on the cupcakes. I hope you enjoy! 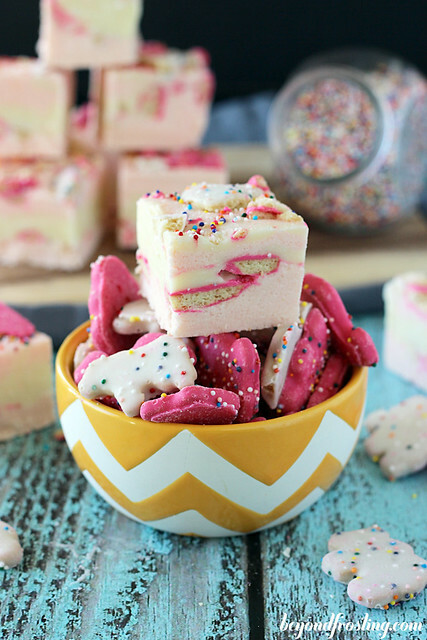 A vanilla frosting mixed with Circus Animal Cookies. Place Circus Animal Cookies in a large Ziploc bag. Use a rolling pin to crush cookies into small pieces. Set aside. Allow butter to soften for about 30 minutes. Or soften in the microwave for 10-15 seconds. Whip butter with a paddle attachment on medium speed until light and fluffy. Slowly add powdered sugar 1 cup at a time. Frosting will become thick. After 2 cups of powdered sugar have been added, add 1 tablespoon of milk. Beat until smooth. Add remaining powdered sugar, followed by remaining milk and vanilla extract. Whip until smooth. Add crushed animal cookies and beat until incorporated. Add sprinkles last and mix in gently. 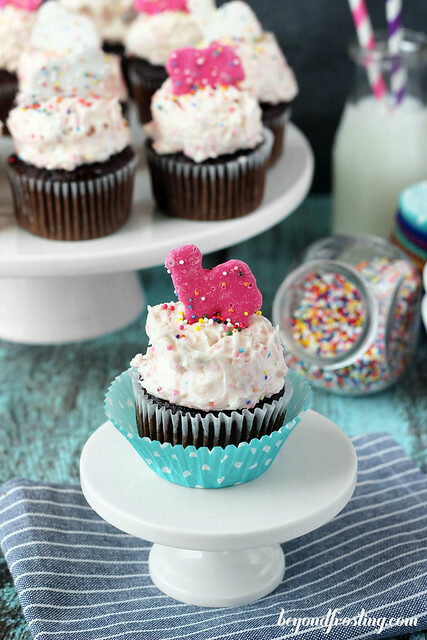 Scoop frosting onto cooled cupcakes. Top with additional sprinkles. Yeeeeeep, I’m obsessed. Officially obsessed. As in, my eyes rolled in the back of my head and I went into a Circus Animal Cookie Coma. I need this in my life. Totally down for a circus animal cookie coma. This frosting is amazing! No words!! Aww thank you! I just can’t get enough frosting! Julianne, you absolute amaze me! I just want to plan a party around these! Speaking of parties… hope you have a most fabulous birthday week! 3 day weekend are amazing! And they are just so adorable. I have a few kiddos who would flip for these. Yum! Have a wonderful Wednesday Julianne! I know right? I wish it was every weekend! Sounds like the perfect way to spend your birthday Julianne! I love, love this frosting. I have been eyeing a bag of circus animals, hoping to make something with them. Now I know what to make. My own birthday is in about a month. I’m thinking I need circus animal frosting! YEAH! Circus animal cookies ROCK! HAHA! Great minds think alike.